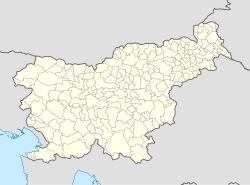 Temnica (pronounced [tɛˈmniːtsa]) is a village east of Kostanjevica in the Municipality of Miren-Kostanjevica in the Littoral region of Slovenia. The parish church in the settlement is dedicated to Saint Peter and belongs to the Diocese of Koper. This article about the Municipality of Miren-Kostanjevica in Slovenia is a stub. You can help Wikipedia by expanding it. This page was last edited on 15 June 2018, at 23:31 (UTC).